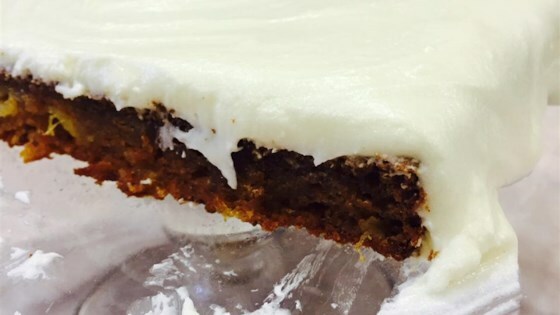 "This straightforward recipe delivers moist, dense, and delicious carrot cake with pineapple under a cream cheese frosting." In a large bowl, combine grated carrots, flour, white sugar, baking soda, baking powder, salt and cinnamon. Stir in eggs, applesauce, oil, 1 1/4 teaspoon vanilla, pineapple and 3/4 cup chopped pecans. Spoon batter into prepared pan. Bake in the preheated oven for 30 to 40 minutes, or until a toothpick inserted into the center of the cake comes out clean. Allow to cool. To Make Frosting: In a medium bowl, combine confectioners' sugar, Neufchatel cheese, 1/2 cup butter or margarine and 1 1/4 teaspoons vanilla. Beat until smooth, then stir in 1 cup chopped pecans. Spread on cooled cake. Just because it has a few carrots in it doesn't make it health food! I reduced the oil to under 1 cup and put less sugar in the frosting to reduce the calories with good results.